In the previous Lesson, we have learned how to write code using various mathematical functions in Visual Basic 2015. In this Lesson, we shall proceed to learn how to work with a group of mathematical functions that deal with angles and lengths of a triangle, they are the trigonometric functions. 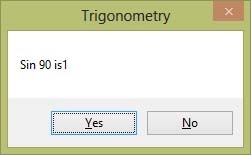 The three basic trigonometric functions are Sin, Cos, and Tan which stand for sine, cosine and tangent. 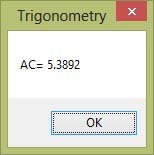 We also deal with the inverse trigonometric functions Asin, Acos, and Atan respectively. The issue is how to get the exact value of π? We can use π=3.14159 but it will not be accurate. To get the exact value of π, we use the arc sine function, i.e. is Asin. In Visual Basic 2015, the value of arcsine is expressed in terms of radian. To convert the value to degree, we use the formula 1 radian=180º/π, where π=2Asin(1).